Senator McKoon introduced SB 309 which would cut Election Day voting by one hour just for Atlanta voters. Senator McKoon also is a driving force behind a legislative proposal for a constitutional amendment requiring that the Georgia Government only provides communications in the English language, despite the fact that Georgia has a growing population of New Americans, and ten percent of Georgians were born in another country. 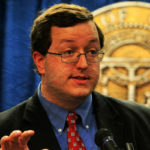 Joshua McKoon was first elected to the Georgia Senate in 2010 and is currently running for Secretary of State to succeed Brian Kemp, who is running for Governor.